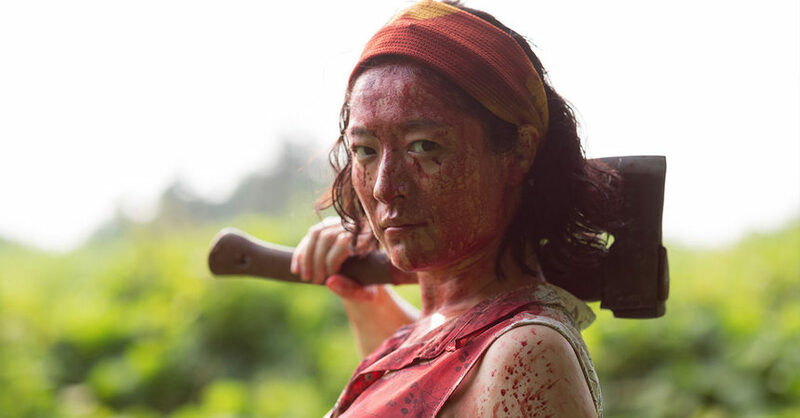 You're probably going to hate the first half hour of Ueda Shinichiro's new zombie comedy, One Cut of the Dead. The thing is, you're kind of supposed to. Framed as a lo-fi, single-take, behind the scenes adventure of a director shooting a lo-fi zombie film that transforms into an actual zombie nightmare when the characters on the set discover that they are being attacked by the undead in real life, One Cut of the Dead's first act is almost painful to watch. Poor acting, poor production value, left-field bizarro characters, and a complete lack of internal logic make this film pretty torturous for even the most intrepid of horror fans. Frankly, you may want to stand up and leave the theater by about minute 30. Without revealing too much about the abundant surprises in store for viewers, One Cut of the Dead is one of the most ingenious deconstructions of the backstage satire in recent years. The film isn't exactly an anthology, but more of a kaleidoscopic view of the creation of a terrible film and all it takes to make even the worst films come to life. Imagine watching The Room, then The Disaster Artist, then a real-time behind-the-scenes making of video that follows the entire project from beginning to end. That's kind of what you'll get with One Cut of the Dead. On paper it sounds exhausting, in practice it's absolutely sublime. The cast is led by Hamatsu Takayuki as the film-within-a-film's intrepid director, Higurashi. Hamatsu takes control of the film in all its iterations and manages to convey a kind of driven mania that fits the balls-to-the-wall manic tone perfectly. The story requires many of the characters, including Higurashi, his self-defense technique obsessed wife, and pretty much all of the lead and supporting performers to change direction on a dime, and it's a trick that director Ueda handles masterfully. The opening 37-minute single take film is going to be a challenge for some viewers, for sure. To call it amateurish would be kind, However, I've never seen a film pay off quite this well before, and it's well worth hanging in for the final section in which Ueda restages the opening segment but from behind the camera, showing how the entire gonzo operation was pulled off, and it's more than worth the wait. Ueda takes what appears to be yet another no-budget, found footage, shaky cam horror film and turn it into an amazing adventure for both the characters and the audience. I don't typically expect to get emotionally invested in this kind of low budget comedy, however, there is so much evolution in this film from the first reel to the last, that it's hard not to cheer by the time the final sequence puts the cherry on an already awesome cake. On top of all of that, there is the clever and insightful treatment of the politics of fame, family relationships, gender imbalance in the workplace, and of course the silliness of contrived horror films and tropes. One Cut of the Dead addresses all of these issues and more without stopping to pound the metaphors into your brain instead allowing them to develop organically in a story that will stay with you long after you leave the cinema. Not to mention the fact that it's goddamned hilarious. It's not often a film catches me completely off guard these days. I watch hundreds of them every year and a lot of them have something interesting to say, some of them even find interesting ways to say those things, but I've never seen anything quite like One Cut of the Dead, and that's exciting as hell!